After more than 25 years working with accident victims, Jim Dodson Law knows how difficult life can be when you've been seriously injured. We strive to make this difficult process as stress-free as possible. For your convenience, we are happy to meet with you at your home, work, hospital room, doctor's office or wherever you feel most comfortable. Jim Dodson Law has helped clients throughout the entire state of Florida. 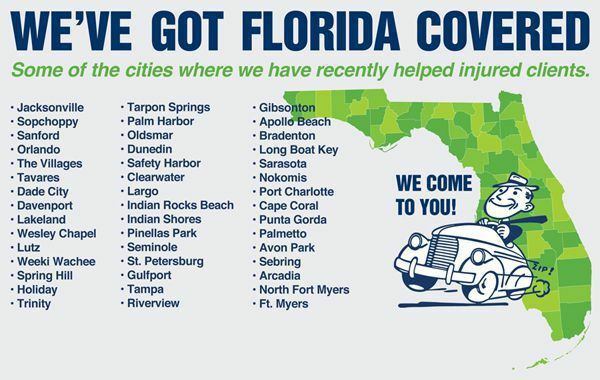 We understand traveling can be a burden, especially when you've been injured. We are also happy to meet with you in the evening and on the weekends. We realize weekly business hours are not always the best time, especially if you have to work. Of course, you are always welcome to come to our office or one of our satellite offices. Jim Dodson Law provides a free consultation to anyone who has been seriously injured in an accident caused by another person. We never charge a fee to answer your questions and we always give you an honest analysis of your case. We take cases on a contingency fee agreement. This means there is no upfront cost to you. When your case settles, the legal fees and expenses are paid from the settlement. You never have any out-of pocket expenses, and never pay a cent unless we win money for you.